Duffy Group’s Founder Kathleen Duffy Ybarra Honored With Lifetime Achievement Award - Duffy Group, Inc.
Kathleen Duffy Ybarra, founder of Duffy Group, was honored recently with the prestigious Al O’Connor Lifetime Achievement Award from the Arizona Society of Human Resources Management (SHRM). This award is given annually to an HR professional or business leader who has distinguished her/himself throughout their career through volunteer leadership, supporting HR related initiatives and making significant contributions to promote and support HR professionals. For more than 30 years Kathleen has worked to make a difference in the HR profession and in our local community through her work as a recognized industry leader, community supporter, role model and mentor. 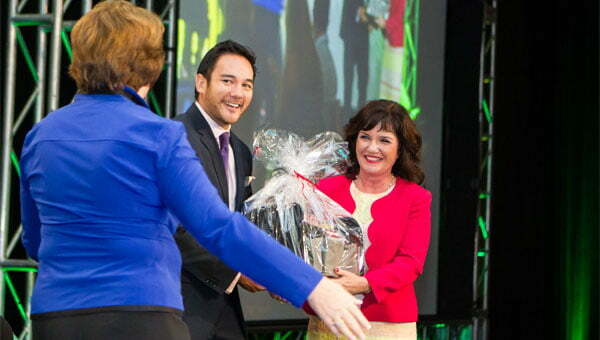 Kathleen is recognized by her colleagues, the HR community and business leaders in the Valley for her exceptional business leadership and success, her commitment to “giving back” by connecting, networking her peers and business associates, creating win-win partnerships and relationships. Al O’Connor was a longtime executive and leader in the Arizona Human Resources community. Al was the first recipient of the award and was honored posthumously last year. This award comes on the heels of several national accolades that Duffy Group received this year. Recently the company was named among the top 100 Small Businesses in the United States in the “Blue Ribbon Small Business of the Year Award” given by the US Chamber of Commerce. The Al O’Connor Lifetime Achievement Award was open to HR professionals with more than 30 years’ work experience. The winner was announced at the awards luncheon and reception on August 29th at the Wild Horse Pass Resort. To view video from Award Ceremony, click here.